Cloud Gate, a public sculpture by Indian-born British artist Anish Kapoor, is the centerpiece of the AT&T Plaza in Millennium Parkwithin the Loop community area of Chicago, Illinois, United States. The sculpture and AT&T Plaza are located on top of Park Grill, between the Chase Promenade and McCormick Tribune Plaza & Ice Rink. 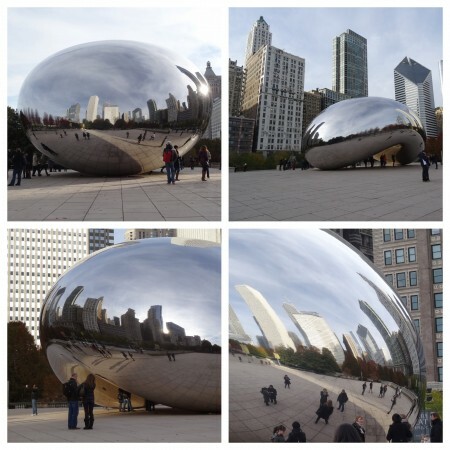 Constructed between 2004 and 2006, the sculpture is nicknamed “The Bean” because of its bean-like shape. Made up of 168 stainless steel plates welded together, its highly polished exterior has no visible seams. It is 33 by 66 by 42 feet (10 by 20 by 13 m), and weighs 110 short tons (100 t; 98 long tons). Said to have been inspired by liquid mercury, the sculpture’s surface reflects and distorts the city’s skyline. Visitors are able to walk around and under Cloud Gate’s 12-foot (3.7 m) high arch. On the underside is the “omphalos” (Greek for “navel”), a concave chamber that warps and multiplies reflections. The sculpture builds upon many of Kapoor’s artistic themes, and is popular with tourists as a photo-taking opportunity for its unique reflective properties.